Nice hotel in a great location just off of international blvd. We were in town to visit Universal Studios which was just a short drive away. Had a great full free breakfast in the morning. TV reception was poor and the remotes did not work well but overall was a very nice place to stay. Clean and Great Continental Breakfast. TV reception was poor and remotes did not work. 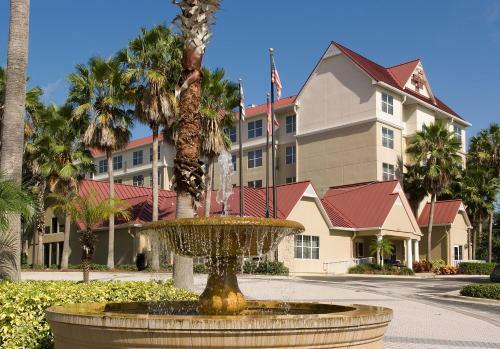 The 124 all-suites Residence Inn by Marriott Orlando Convention Center provides affordable extended-stay accommodation for both the business traveler and families on vacation. Items included with the room rate are a full buffet breakfast, snacks and drinks at the afternoon managers reception, high-speed Internet access, local telephone calls, parking, a copy of USA Today and coffee available in the lobby 24/7. 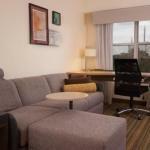 The five-story, non-smoking inn has two rooms for social or business functions. The larger can accommodate 50 guests. The hotel is half a mile from the Orlando-Orange County Convention Center and within walking distance of restaurants and attractions in the International Drive resort area. There are three golf courses a short distance from the hotel and all of the area theme parks, including Walt Disney World, are within easy driving distance. All the one and two-bedrooms suites have a fully equipped kitchen with refrigerator with icemaker, conventional and microwave oven, dishwasher, stove, toaster, toaster oven, silverware and crockery. Other features are a work desk with high-speed Internet access, dual-line telephone with voicemail, cable television with news and movie channels, pullout sofa bed, alarm clock, tea and coffee making facilities, iron and ironing board and a hairdryer. This inn has an outdoor heated swimming pool, whirlpool and a fitness center. The complimentary breakfast is the only meal served here but the hotel does offer a grocery shopping service. Restaurants nearby include a Bahama Breeze, Café Tu Tu Tango and Charlies Steak and Lobster House. The 24-hour front desk has safe deposit boxes and information on the Orlando attractions and events. Other amenities include a games room, copy and fax services, a coin-operated laundry, picnic area with barbecue grill, valet dry-cleaning and vending machines. Several former guests at this inn say the breakfast provided here is one of the best in town  and it is free! Business clients enjoyed the location, within walking distance of the convention center and families said the fully equipped kitchens enabled them to eat in and save on restaurant costs. Money saved enabled them to linger a little longer and enjoy more of Orlandos numerous theme parks. There were also good reviews about the friendly and efficient employees.